Used for digestion, immunity, nutrient absorption and inflammation. 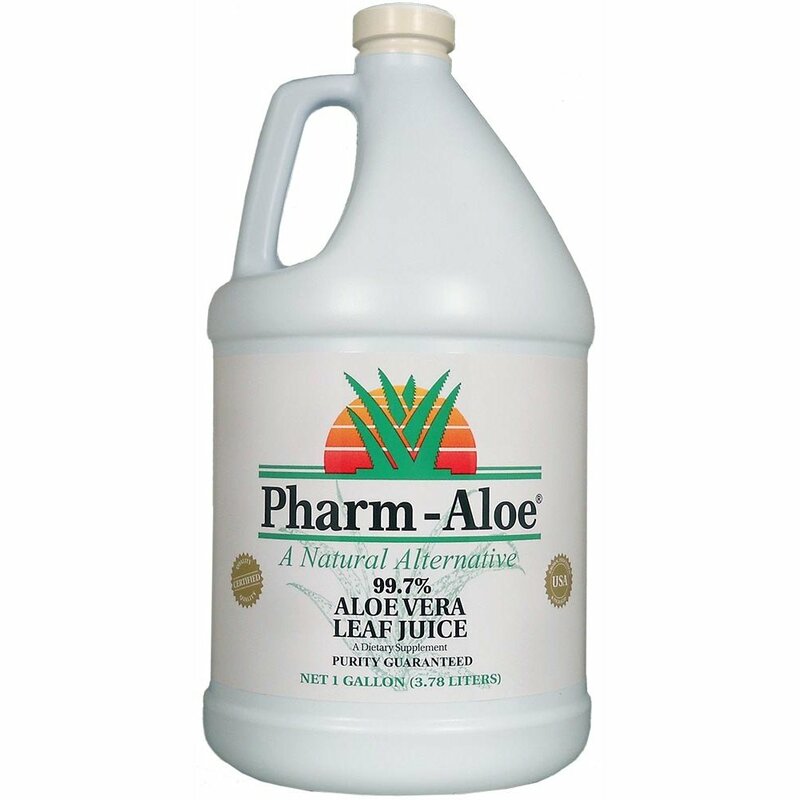 Ingredients: Organic Aloe Vera Leaf Juice, Citric Acid, Potassium Sorbate. What's the difference between inner leaf or filet and leaf or filtered whole leaf aloe vera juice? Aloe Vera Leaf Juice has 3 to 6 times more potency than Aloe Vera Fillet (inner leaf) Juice or Gel. This is due to the fact that the greatest concentration of active ingredients is where the rind interfaces with the inner gel of the leaf. If, in processing, only the inner gel is removed from the leaf and the rind discarded, you lose 300-600% of the active ingredients. We utilize the entire leaf by grinding the leaves into a puree; then we remove the rind, anthraquinones, aloin, and aloe emodin leaving a clear Aloe Vera Juice that has 3 to 6 times more potency. 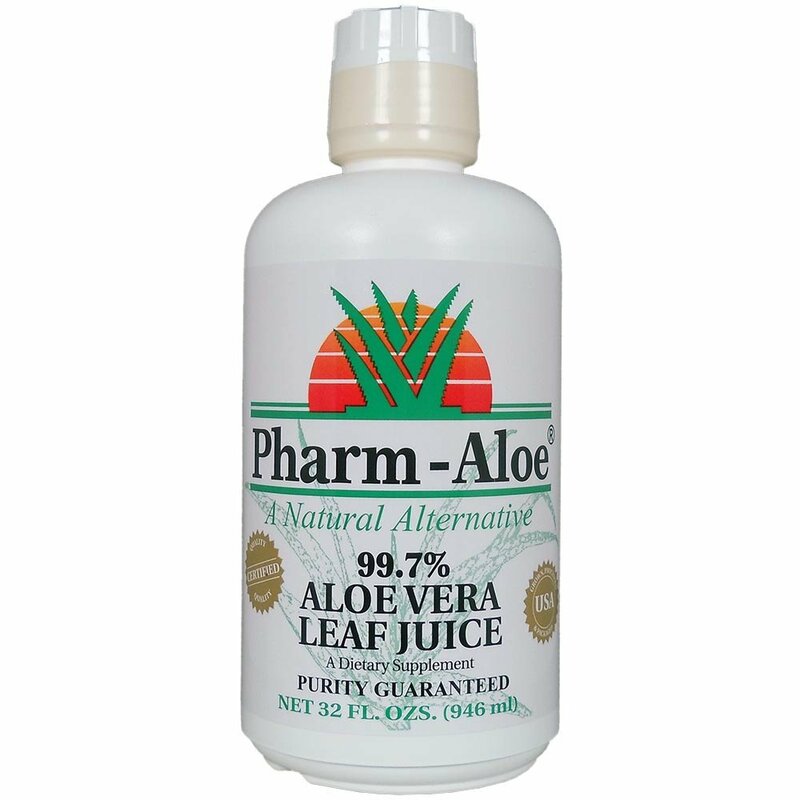 Therefore, you can use 1/3 to 1/6 less of our Pharm-Aloe® 99.7% Aloe Vera Leaf Juice and still get the same benefits as Inner-Leaf Aloe Vera Juice or Gel. This makes it more economical for you to enjoy the benefits of Aloe Vera. For Stress (ulcer symptoms, digestive issues, etc): 16 capfuls (16 oz.) per day. Can be administered poured over pellets or grain or by syringe orally. 1 ½ cups of whole oats will soak up 4 oz. aloe vera juice in about 5-10 minutes. For Maintenance: 2 capfuls (2 oz.) per day. This supports the immune system, digestive system, balances stomach acidity, aids cellular communication, supports normal detoxification, normal joint function, and provides anti-oxidant protection. Ingredients: Organic Aloe Vera Leaf Juice Concentrate, Citric Acid, Potassium Sorbate. 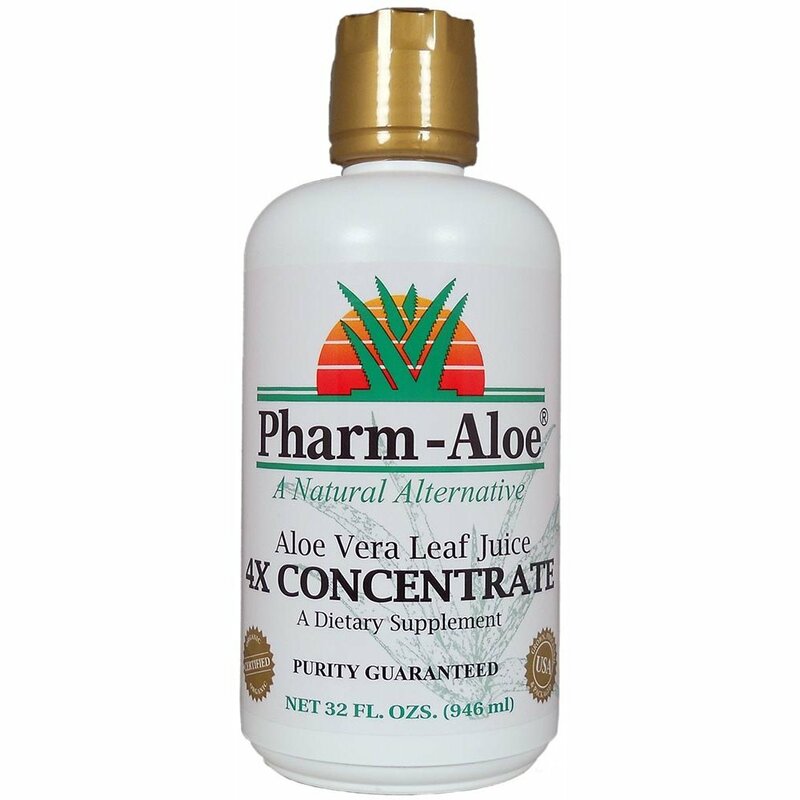 Pharm-Aloe Aloe Vera Leaf Juice 4X CONCENTRATE is 4 times more concentrated than our 99.7% Aloe Vera Leaf Juice. We accomplish this by placing our 99.7% Aloe Vera Leaf Juice into a rising and falling film evaporator which removes naturally occurring water at room temperature. This enables us to increase the active ingredient solids from approximately 1.5% to 6%; a four fold increase. This is important because the solids are responsible for the beneficial effects of Aloe Vera. This product does not contain the rind, aloin, alo emodin. These compounds known as anthraquinones have a laxative effect. We have been filtering the anthraquinones since 1970. This juice has a strong flavor due to the high concentration of active ingredients; we recommend mixing with your favorite fruit juice. Calcium and magnesium may precipitate out of solution due to the high concentration and appear as white flakes that settle to the bottom; we attempt to mitigate this by filtering after concentration but precipitation can occur after packaging. For Stress (ulcer symptoms, digestive issues, etc): 4 capfuls (4 oz.) daily (2 in am. and 2 in pm.) per 1000 lb. horse for at least 14 days can be administered by pouring over pellets or grain or by syringe orally. With this dosage you will get 8 servings per bottle. For Maintenance: 1/2 capful (1/2 oz.) per day. This supports the immune system, digestive system, balances stomach acidity, aids cellular communication, supports normal detoxification, normal joint function, and provides anti-oxidant protection.